Last month, the honor V8 handset was certified by Chinese regulator TENAA. 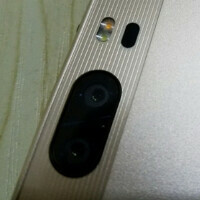 As is the tradition, photos of the device (which is made by a division of Huawei) were published by the agency and revealed the dual camera setup on the back of the device. The two cameras are both 12MP sensors and allow the user to take 360 degree video (as seen in the GIF image below). The honor V8 features a 5.7-inch display with a 1440 x 2560 resolution. Huawei's home grown Kirin 950 (or 955) chipset is said to be under the hood with 4GB of RAM and 32GB of expandable storage inside. Those seeking additional storage can use the 64GB capacity microSD slot. A 3400mAh battery keeps the lights on, and a fingerprint scanner can be found on the back of the phone. We expect to see the honor V8 unveiled on May 10th. just human being jesus christ..